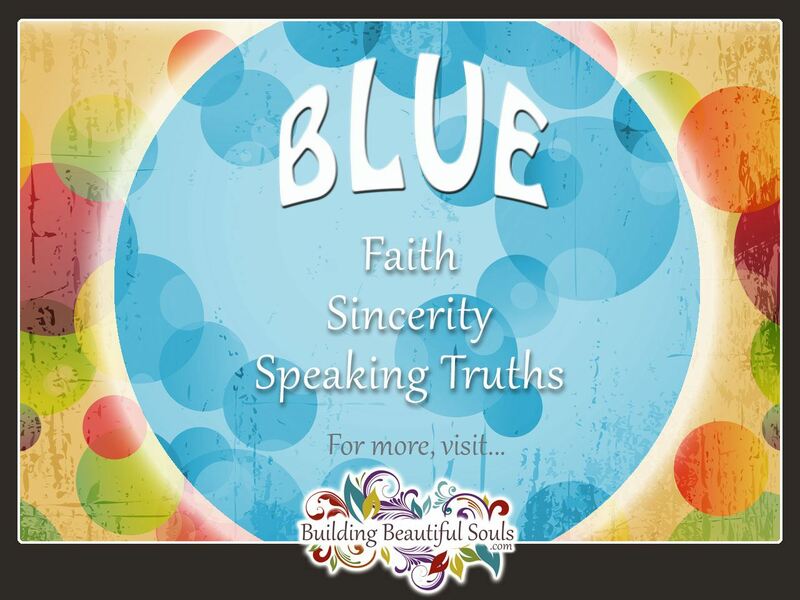 The color Blue vibrates magically with truthfulness, conviction and sincerity. Blue is the color of loyalty. Blue never really likes to be center stage and avoids conflict, making it a powerful color ally for peace. Blue likes order, security and exhibits the ability to do the right, best thing. But don’t mistake this upright color for being uptight. Blue has tremendous depth. So, what does the color blue mean? Explore with us as the world’s most popular color let’s you peek into its soul. For people in high-stress situations, adding Blue to the environment can be very calming. Pale Blue in particular eases anxiety, much as just staring at a cloudless, blue sky. In metaphysics the color Blue is associated with the Throat Chakra and resonates with our ability to speak our truth gently and respectfully. Energy healers and lightworkers appreciate the color Blue for its ties to insights from the Higher Self and the Divine. In fact, it is an excellent hue to use when studying your faith, praying or meditating. Blue healing crystals (such as Celestite, Angelite, Lapis Lazuli) help facilitate connecting to the angelic and divine realms. Blue brings harmony to relationships, always wanting to help in some way. It energizes trust and quality living. Blue is one of the most favored colors because it makes people feel safe. About the only down-side in Blue symbolism is that it doesn’t manifest transformation easily. Blue rooms make people think deliberately, sometimes reveling in the past trying to measure it against current circumstances. Code Blue is used in medical environments when a patient needs to be resuscitated. This has to do with the body turning ‘Blue’ when deprived of oxygen. And, so, Blue color meanings can be associated with crossing over and is very likely where the saying ‘feeling blue’ comes from. If you love the color Blue you are a cautious sort. Spontaneity isn’t really in your vocabulary – you would much rather think things through. Blue has a conservative air and is dependable as the day is long. Blue personality people trust others, and likewise want to be trusted deeply. People know that you are sincere, and rarely get flustered. Self-control matters to you, as does private time where you can truly listen to your instincts and the Divine. This doesn’t mean being anti-social but your high level of sensitivity makes regular down time necessary. If you are going to be around people its generally a small circle of family or friends rather than a big affair. Folks who love the color Blue have huge hearts and may overlook their own needs in favor of those of others. This is something you need to remain aware of. This is especially the case since “true blue” rarely leaves a cause once engaged. In business and life, Blue hates chaos. When things get dis-orderly it puts you into a tail spin and find things overwhelming. In relationships you are faithful to a flaw. Watch out for becoming co-dependent or controlling. You prefer to follow rather than lead, and lean toward people that agree with your beliefs to include in your inner Circle. Blue has sentimental overtones. Bring tissues to that “chick flick”! And by the way, bring a friend. You know how to make people feel comfortable and welcome. The term standoffish isn’t in your vocabulary. Throughout Blue’s life they hunger to learn more and may turn into the never-ending student. You are knowledgeable in many subjects that may seem trivial to others but fascinate you. Oddly these tidbits come in handy in an off-the-cuff conversation. Blue naturally gravitates toward spiritual studies. Once you find a path you remain devoted and reverent. From this deep, meaningful core you drive energy toward various good causes. The quest in Blue’s life is finding ageless truths, living your beliefs and securing personal peace. Psychologically speaking Blue vibrates with predictability, organization and conventional thought. It’s often used in ad campaigns because people find it approachable. The color Blue in logos represents meticulous detail. It also symbolizes expertise and knowledge you can trust. In nature, the sky and bodies of water are blue. This gives it the additional psychological impression of clarity and cleanliness. Blue is a cool color mentally, which makes it very relaxing. Diplomats may wear blue suits or meet in blue rooms for this reason. Blue also works very effectively in bedrooms for people who have sleep disorders. Law enforcement personnel wear Blue uniforms intended to make us feel safe and protected. Wear blue or carry Blue stones and crystals when you need to present an argument that you want believed. Two examples of pocket talismans are Aquamarine and Lapis. When something happens spontaneously or unexpectedly we use the phrase, “out of the blue” which imbues Blue with connections to the Heavens and other realms. After all, Heaven knows! Use sky blue for peacefulness, love and healing, pale blue for inventiveness and liberation, azure for resolve and dark blue when you want to appear “traditional”. Blue crystals and stones bring the power of trust, sincerity, and responsible actions. Use blue crystals and stones when you want to facilitate true speaking and seeing. Blue is the color of the Throat Chakra – communication. Iris Iris (Rainbow Goddess), link between heaven and earth.